Our 70-acre business park is one of the most exciting developments in the North West and will create 1,400 new and sustainable jobs. Phase One of the development will be completed by early Spring next year, with quality industrial units ready for occupation. The bridge and an access road link the £50 million business park to Junction 9 of the motorway, giving direct access to the heart of the site, which is on the outskirts of Padiham, East Lancs. James Chapman, the managing director of Eshton, commented: “This is a very significant landmark in the development of our quality Grade A business park. It opens up the site from the motorway, which allows potential occupiers to see exactly what we are creating here. 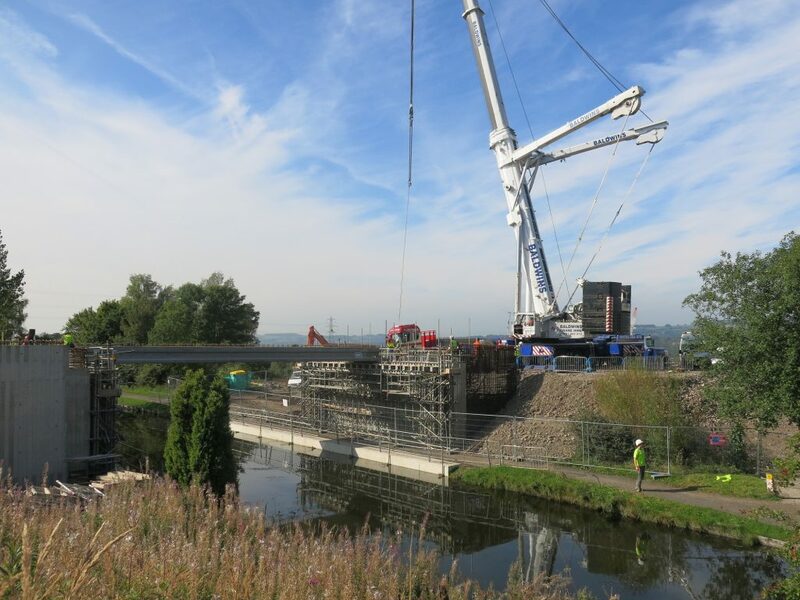 “These are exciting times at Burnley Bridge. As well as the infrastructure going in, a 64,100 sq ft warehouse building is being comprehensively refurbished, providing a superb base for a logistics or industrial occupier, and 29,000 sq ft of speculative new units are being built. These will be ready for occupiers to move into in February. “Cobalt, the warehouse, is being stripped back to its steel frame and then reclad to satisfy the requirements of the 21st century. The speculative industrial units, Magnesium Court, are being built in two blocks, with sizes ranging from 3,000 sq ft to 19,000 sq ft,” explained James. Michael Cavannagh of marketing agents Trevor Dawson believes that Burnley Bridge possesses a number of key advantages over its rivals. He explained: “The location, immediately off Junction 9 of the M65, is perfect. It is the first speculative development along the M65 for at least five years, which means it is satisfying pent-up demand, and it can accommodate a wide range of requirements from 3,000 sq ft up to 500,000 sq ft. That provides potential occupiers with a massive choice,” he added.